The world is a scary place these days. Fortunes can be made or lost in the blink of an eye, but through it all gold still remains a safe-haven investment. This month Gold broke through the $1,300 mark. There are a number of reasons that could set and sustain gold’s bull run. Looking at all the geopolitical issues today, very few seem like they will be resolved anytime soon. North Korea has not been resolved, Israel is as volatile as ever, ISIS is not relenting, America won’t fix it’s dysfunctions and President Donald Trump won’t become anyone but himself. The stock market will also continue to look like a bubble unless someone decides to burst it. – Global interest rates staying negative. – High broad equity valuations and complacency. – The U.S. Dollar enters the bear market. The most pertinent of these four is the broad valuations and market complacency. Let’s look at the valuations by starting with the S&P500. It is currently overvalued because of this belief that Trump’s intention to cut corporate tax will drive future earnings in a positive direction. However, slashing corporate tax may have a bad effect on a company’s valuations. We can debate how much of a safe haven gold is luckily, there is a well documented history of gold’s performance over the years. Between 1961 and July 2017, the gold price returns were positive, especially when inflation went up and stock market returns were in negative numbers. Indications show that we can expect gold to be strong against a weak dollar. Complacency has affected a lot of market analysts and other qualified financial commentators. A lot of people expect the gold market to be sky high given the state of affairs in the world. Take into account, Brexit, Trump trade tariffs, the Iran deal, climate change, etc. The best time to buy insurance, in this case gold being insurance against economic depression, is when the risk event isn’t the imminent threat at the forefront of investors’ minds. Gold is currently an under owned, underappreciated commodity which could turn out to be the best insurance to buy into right now. According to JP Morgan’s money managers hold the view that gold could reach peaks of $1,400 by the end of the year. Gold’s fluctuations over and under $1,300 is an expected reaction as the market has to self-correct before it can begin to climb again. Banks like JP Morgan and many money managers believe that gold has entered a bull market. If you have been sitting on the sidelines waiting to buy gold, then this could be lowest that gold will be for a while. We may be headed higher, but how long it will take and what will trigger that surge past the $1,300 threshold no one really knows. The time to buy gold is now! There is a chance that you don’t know Agnico Eagle, one of the most promising mining companies in the world. It has been around longer than many, yet it has remained partially in the shadows. Truth be told, Agnico Eagle Mines Limited has brought attention to its operations recently due to the fast-growing numbers that the company is enjoying. In fact, Agnico Eagle reported US$1,896.8 million in revenue by the end of 2014, representing a whooping 15.8 percent increase. For this and other reasons, paying more attention to this Canadian mining colossus would be a good idea for investors thinking about the future. It’s true that Agnico Eagle Mines Limited isn’t a new player. In 1953, Cobalt Consolidated Mining was born in Canada as a merger of five different mining companies that were facing important challenges. Four years after that, the group decided to change its name to Agnico Mines. Again, six years later, Agnico Mines merged with Eagle Mines Ltd, a company that was mostly dedicated to gold exploration with modest success. This merger allowed the growing company to fruitfully develop projects based on the yellow metal, which can supply the ever growing technology sector along with selling to gold bullion refiners sectors. A decade later, Agnico Eagle would acquire Dumagami Mines Limited’s assets, including the mine that is now called LaRonde mine, which is currently the company’s main operation. During the 90s and 00s, Agnico Eagle continued its expansion steadily, acquiring operations in Canada, Mexico, and Finland. Other remarkable acquisitions by the company were the Meadowbank gold project, the Meliadine property, and Rubicon Minerals’ participation. Nowadays, Agnico Eagle has remarkable mining ongoing operations with no cease at sight. The magnitude of these greatly varies, with LaRonde mine being the biggest one for the company and at the same time, the deepest mine in America. LaRonde: This underground mine has an estimated life from 1988 to 2024, reporting productive numbers around 305,788 ounces of gold, 988,000 of silver, 4,687 tonnes of zinc, and 4,416 of copper in 2016. Lapa: A considerable smaller underground mine, it’s located near to LaRonde site. This operation has an estimated life from 2009 to 2017, reporting a production of 73,930 ounces of gold during 2016. Goldex: In the same region as the previous two, the Goldex operation consists in a multipurpose underground mine. While Agnico Eagle is the operation’s owner, the national government joined the activities to progressively restore the Manitou mine tailing site. Its estimated life is between 2013 and 2025 and 2016 operations produced 120,704 ounces of gold. Meadowbank: This open pit mine is expected to complete its operative life by 2018 while it produced 312,214 ounces of gold and 221,000 of silver in 2016. Pinos Altos: Outside Canada, we have the Pinos Altos mine in Mexico, with an estimated life between 2009 and 2023. In 2016, it produced 240,068 ounces of gold and 2.7 million ounces of silver. La India: Also in Mexico, La India mining operation produced 115,162 ounces of gold and 486,000 of silver in 2016. This open pit mine is expected to be fully operative until 2022. Kittila: The Kittila mine is the only Agnico Eagle operation outside America. This mine is located in Northern Finland and its one of the largest gold deposits in Europe. It produced 202,508 ounces of gold in 2016 and the estimated life is between 2009 and 2034. Having increasing prices in gold isn’t always a good news for producers and investors. A recent announcement from the World Gold Council said that there is a high chance of Indian gold demand dropping to 750-800 tons by the end of this year in comparison with 860 tons from 2015. The main reason for this is that gold prices have been going up steadily, making it too expensive. While investors are quite happy about the bullish market, this situation could reverse performance by the end of this year and the first semester of 2017. As you might know already, India is the second gold consumer in the world, only behind China, which is also decreasing its gold demand for the upcoming years. The gold market has been positively bullish, stimulated by uncertainty regarding US economy, Europe’s decisions on monetary policies, and other geopolitical events of great relevance. But massive changes in Indian gold consumption could be a decisive factor for the precious metal’s prices. But a higher price isn’t the only factor affecting demand. In recent months, India’s jewelry industry was on a strike, demanding big changes in the tax system. The government increased taxes on this sector, causing great unrest and leading jewelers to an indefinite strike. Another inciting factor for the strikes was the imposition of a Pan Card number for every jewelry purchase above 200,000 Indian Rupees. According to jewelers who went on strike, this imposition would greatly affect the consumer, ultimately leading to losses. Conversations between the jewelry industry and the government led to positive changes, getting producers go back to work. But don’t think that this was the decisive element changing jewelers’ minds. This year monsoon was flourishing all across in the country. Just like always, monsoon performance is translated into gold demand during Dewali and wedding seasons, both starting soon. The jewelry industry isn’t capable of being absence during these seasons, even if the circumstances were different. With a highly positive monsoon, gold demand from consumers will exceed expectations. With the jewelers strike out of the equation, Indian economy is only facing high prices. The gold market remains bullish and most forecasts indicates that it isn’t going to change. In fact, with the great uncertainty that is being experienced on a worldwide scale, gold prices are more likely to increase. With the US elections, unclear FED’s plans for the future, the Brexit, and actual monetary policies being used by the European Central Bank, many investors have their doubts regarding Forex and stocks. So far, the yellow metal seems the most suitable alternative. Even with China and India decreasing their numbers, gold is could remain bullish. In comparison, India’s expectations about demand are more negative than the Chinese ones. Recent official reports told the media that China is planning to decrease demand growth, instead of demand itself. This means that the sector will continue to expand, despite the blow coming from India. The precious metals market unpredictability has many in a bind over which direction to go, those who are holding on to physical precious metals or even mining stocks are at the edge of their seats based on what has been unfolding, and many have actually turned towards the capital markets based on the more attractive returns that it has to offer. Although this may seem to be the best move currently and for the short run, those holding on to precious metals related assets are definitely in a better position for the long run. This based on the fact that the precious metals market has been pressured into submission by the powers that be, and it is only a matter of time before the lid pops open sending the precious metals markets soaring. Gold related assets are and have always been long term investment schemes and buying gold with the intention of making gains in the short term is not only unadvisable, but it is also extremely dangerous from a financial perspective as the precious metals market is known to fluctuate steeply in both ways triggered by the slightest economic spark and unless would be investors have enough patience and resources to endure market pressures working against their positions it is best not to dabble in it. Most gold bugs who own physical bullion however are optimistic about the current lower prices of gold as it is allowing them to bring the cost of their physical gold holdings by at least 10 % giving them better margins for the future. What exactly is happening to the precious metals industry is pretty obvious, despite the current shaky global financial situation and volatile markets the strength of the dollar and the appeal of the capital markets are holding ground. Coupled with lower oil prices and governments trying to stimulate economies which require them to inject funds into the markets, the lure of the capital markets is difficult to resist. This has also rendered conventional theories related to the commodity markets and how they respond inapplicable as markets are anything but predictable these days. One thing that is for certain is the fact that the disorganized and fragile global financial system is destined to crumble as even well informed financiers are uncertain of the mechanics that are at work and over the last two to three decades the financial machine has become too obscure to a point that it has become mystical and the only constant in the equation seems to be the fact that gold and other precious metals are still being considered as a safe haven by everyone and it does seem that most have a finger or two in precious metal pies in the event that the capital markets disintegrate. Many have grown tired of waiting for gold prices to rise and gold bugs are reeling from the losses that they are incurring from the costs of holding, storage and insurance and many gold bugs fear that when the time does come to sell, the margins will not be justifiable. Investing in gold does not necessarily mean buying gold bars by the dozen and storing them in a impregnable safe tucked away behind a portrait of the Mona Lisa, although that is an option and according to most gold bugs, it’s the best way to invest in gold, there are investors who prefer to take a much more indirect approach towards investing in the shiny yellow metal. They do it by investing in gold mining company stocks; however, before you take the leap into this realm, there are some things that an investor should essentially know if he or she is going to use this approach to invest in gold. The good thing about gold mining stocks is that gold mining stocks are rather easy to buy or sell hence if the situation arises whereby you need instant cash you would be able to sell your stock immediately and in comparison to physical gold bullion that you have stored in a safe, the process may take a tad bit longer as it goes through the assaying process and getting a buyer who would be willing to pay a reasonable price for it. On the flip side however, if at all the gold mining stock that you own belongs to a company that is embroiled in some kind of issue that may range from low production, lack of funds, pollution or land acquisition issues, it may not be quite as easily traded. Always remember that by buying a gold mining stock, the investor is actually buying a portion of the company that is mining the gold and although there is potential for additional upsides the downside risks are more often than not equal. For instance, gold mining is capital intensive meaning that it requires a substantial amount of cash to develop and operate a mine, hence buying into a mining company that has a sound financial background is one of the most vital aspects. Gold mining companies are also known to play the market by lowering production when gold prices are low and increasing production when prices are favourable to maximise profits, thus gold mining stocks may tend to undergo massive price swings making patience a key component in being successful with gold mine investments. Nevertheless the main thing about investing into gold mining companies is in being able to identify good gold mining stocks and this obviously would take a significant amount of research. 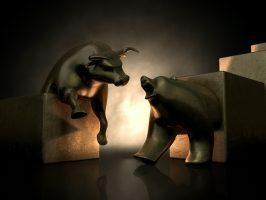 Most seasoned investors go for value-plus proposition which in layman terms mean that if the price of gold rises significantly they expect the mining company to be able to offer a 1x plus gain as an additional profit potential, because if that is not in the option, then the investor might as well invest in physical gold and as mentioned earlier store it in a safe hidden behind a DaVinci painting. It is also imperative that the gold mining company has distinct qualities that make them good investments such as effective management, competent with environmental and political risks and also has the ability to obtain finance at the drop of a hat.